My favorite thing about Mexican food is the zesty flavor of lime. I mean, in my opinion just adding a bit of lime juice makes any Mexican recipe more flavorful and fresh and delicious. So I decided to embrace my lime loving person and make these Lime Taco Cups. 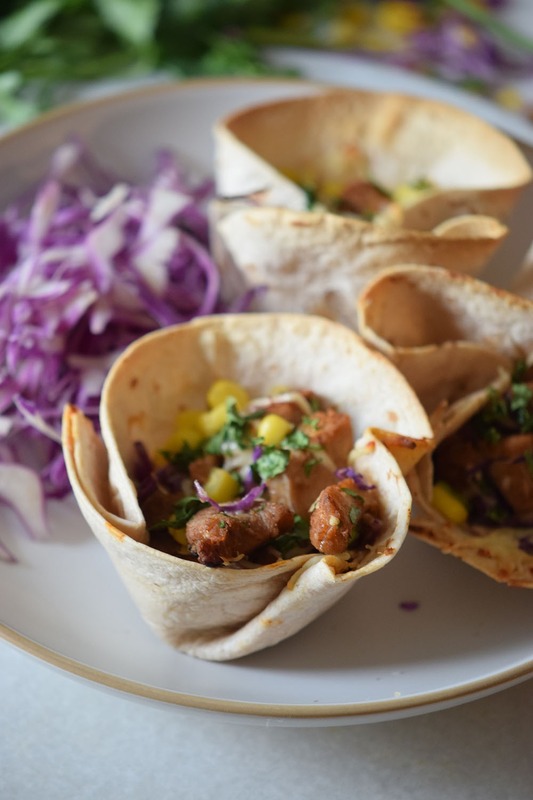 This Lime Taco Cups recipe is zesty, spicy and super full of flavor in the best possible way. Oh, and it’s also like super easy to make and perfect to feed a crowd, do I need to say more? 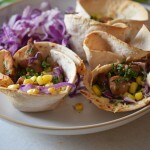 I like to make the Lime Taco Cups with pork but you can substitute it for chicken. Both options are just as good and both options are super tender and melt in your mouth good. To start I cook the pork with spices, adobo (you can find adobo in the Latin Market or in the International aisle of your supermarket) and a healthy dose of lime juice. Once it’s done I set it aside and it’s time to make the taco cups. 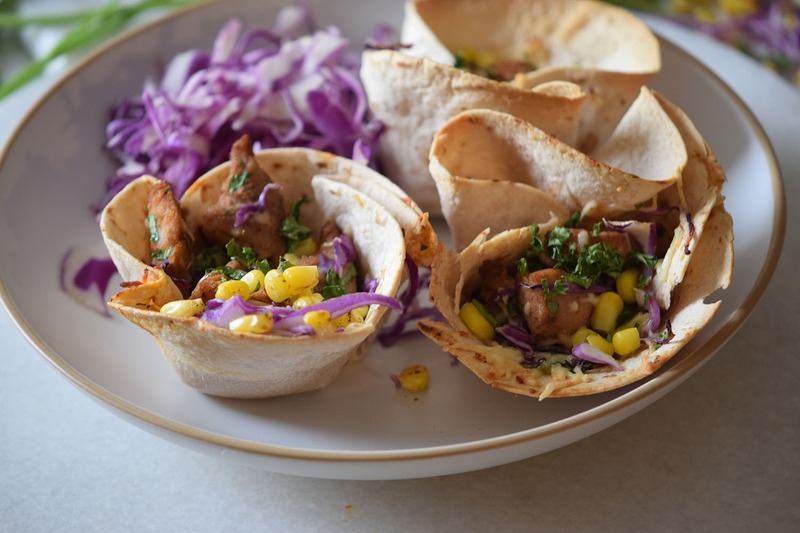 The great thing about lime taco cups is that they are transportable, they make great appetizers, are perfect fo a picnic or an outdoor party but at the same time are a great dinner idea! Making the cups is super easy, just place the tortilla on top of a cupcake pan and press down like if you were placing a cupcake liner. Fold a bit twist a bit more and voila that’s it! 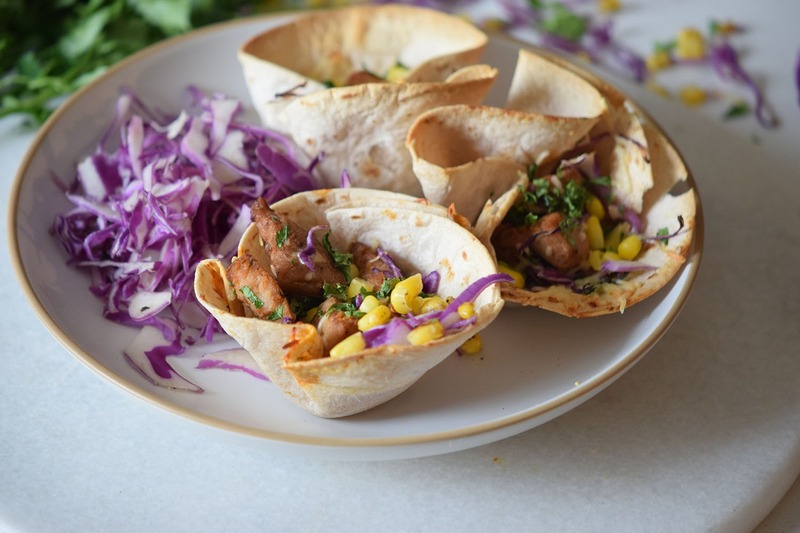 Your very own taco cups are ready to be filled and baked. 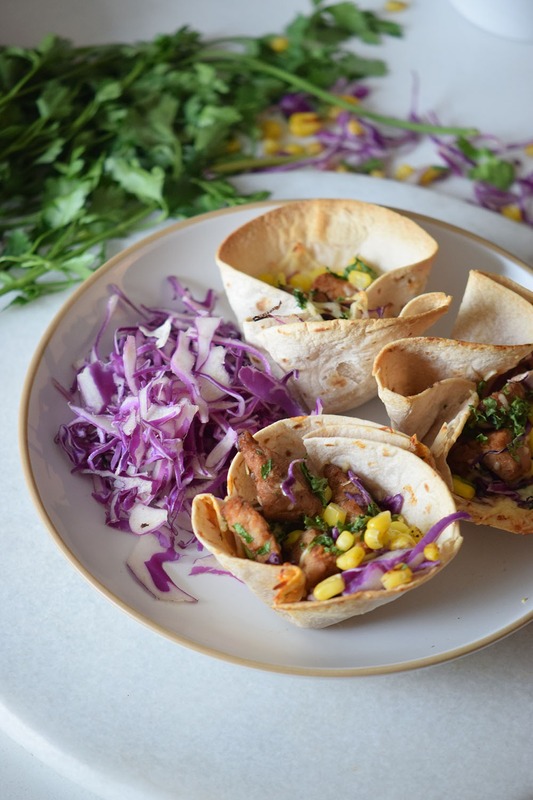 Fill them with the pork, corn, cabbage, cheese and cilantro and bake for 15 minutes, the tortillas are gong to end up golden and crispy and will hold the shape. 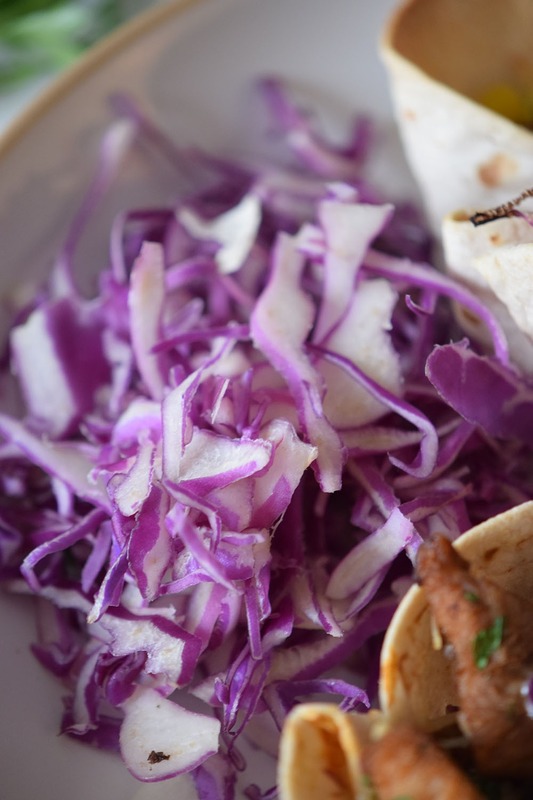 Then serve them with some red cabbage seasoned with salt and lime juice. Super good, citrusy and just the perfect Summer flavor combo. Take the pork to a pan over medium heat, add the lime juice, adobo, salt, and pepper. In a bowl mix the corn, red cabbage, and shredded cheese, then set aside. In a cupcake pan place the tortillas as you would place a cupcake liner. 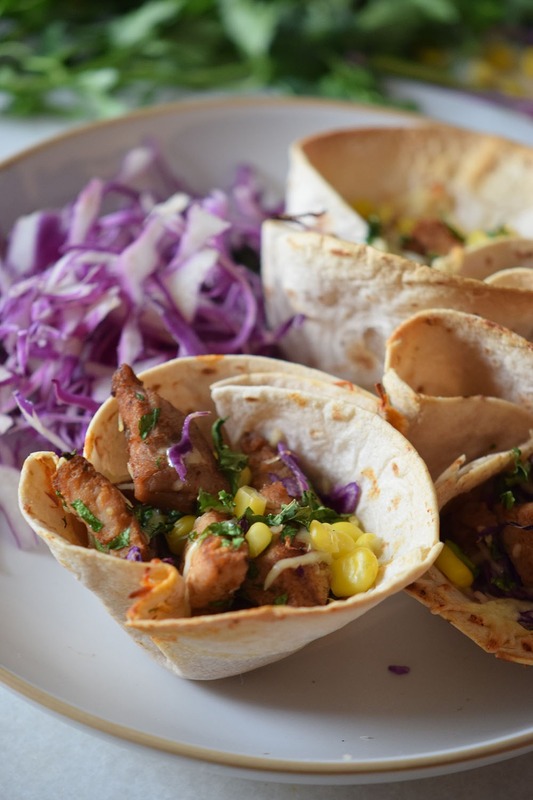 Fill the tortillas with ¼ Cup cooked pork and ¼ Cup corn mix. Take to the oven for 15 minutes or until the tortillas get golden and crispy. Tips: You can top them with more cheese, swap the pork for tofu or chicken, or use corn tortillas for a gluten-free meal.